For anyone who is looking for a performance, rugged and designed for the great outdoors package on their Chevrolet Silverado 1500, the Chevy Reaper Package is an excellent option. The Chevy Reaper Package has been floating around between different dealerships and trade shows over the past few months, and now it looks as if it is ready to make its debut for real and allow individuals to purchase the upgraded trim model. Of course, there are different elements you need to know about the Chevy Reaper Package in order to make sure this is the right package upgrade for you. For starters, the Chevy Reaper Package is going to feature three-inch suspension lift that is going to give you room enough 33 inches above the ground. This way, you can opt into larger tires without having to worry about rubbing the tires against the fender walls in the vehicle. The Chevy Reaper Package is also going to come with a Magnuson supercharger, which improves the horsepower to 500 or 600, depending on what engine you decide to opt into (the EcoTec 5.3 liter is the default model, but you can also purchase a 6.2 liter V-8 engine as well). Other standard features of the Chevy Reaper Package include a unique hood and grille insert, plus a high-ground clearance bumper. 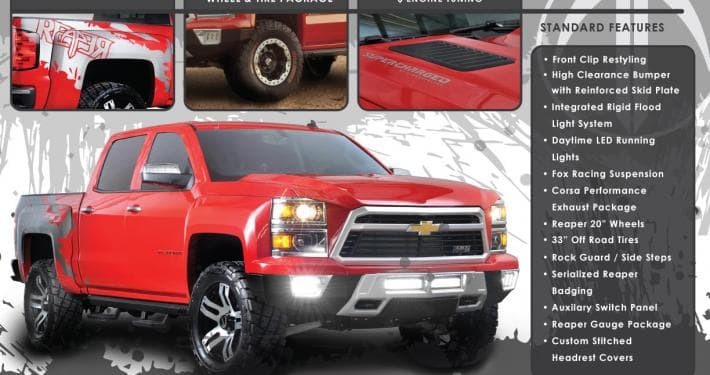 Plus, the Chevy Reaper Package design takes advantage of Fox Racing shocks, so you can take your Chevy off roading and feel just as comfortable as if you were driving along the highway. You can also opt into an additional 17-inch headlock wheels, plus sidesteps. After all, with the truck increasing in clearance, chances are you might want a bit of help climbing into the taller vehicle. Even if this is not something you would use, other passengers might like the step up, in order to prevent injury while climbing into the vehicle. As of right now, there are going to be three different Chevy Reaper Package stages you are able to select from, and while the price tag is still in discussion, it looks as if it will start at around $55,00 and run all the way up to $65,000. If you are interested in the Chevy Reaper Package, make sure to contact your local GM dealership and see if they offer this package. The package is only going to be offered at select dealerships across the country.